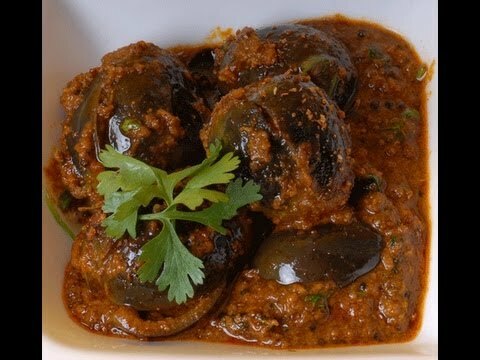 If you are one of those who think that Brinjals are just one of the ‘boring’ veggies, you definitely have to try this recipe! Malvani cuisine is characterized by extensive use of coconut and peanuts. Whip-up this authentic yet home made Malvani dish in less than 30 minutes! Wash the brinjals and cut off the stems. Now, slit each brinjal four times vertically from the bottom and keeping the base intact. Keep aside. Cut the onions in big pieces and grate them in a blender to make a paste. In a cooking pan, roast the grated coconut, peanut powder, salt and all the spices for 2-3 minutes. Add the onion paste, tamarind pulp, jaggery and sauté till mixture turns golden brown. Let it cool for 10 mins. Stuff this mixture in the brinjals. In another cooking pan, pour 2 tbsp oil and when heated, add the sesame seeds. Keep the flame low so that the seeds don’t burn. Add the stuffed brinjals in the pan. You can add any leftover stuffing masala along with 1/2 cup of water. Fry the brinjals gently for 5 mins. Add water if required. Cover the pan with a lid and cook on a medium flame for 15-20 minutes till water evaporates and brinjals turn soft. Remove the lid and check if brinjals are cooked evenly. Enjoy this Malvani delicacy with piping hot bhakris.